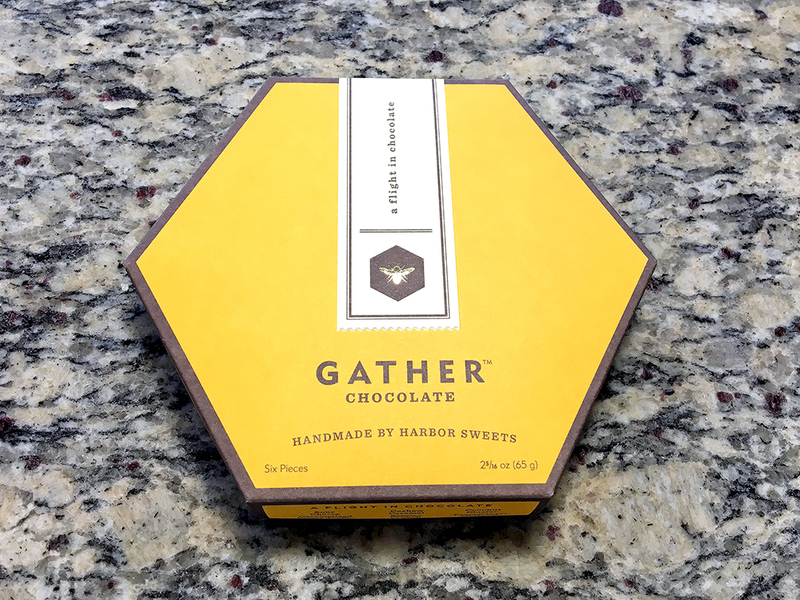 Prior to their release on September 6, 2016, I had the opportunity to try a free sample of Gather Chocolate by Harbor Sweets, which makes handcrafted artisan chocolates. Even though this was my first taste of Gather Chocolate, I found it hard to believe that such beautifully crafted chocolates are handmade. 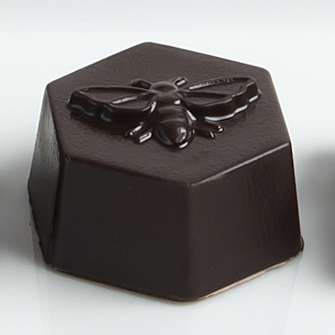 In addition to making a spectacular set of chocolates, Gather is Harbor Sweets’ “mission-driven” line where 2.5% of the profits from each sale are donated to the “Pollinator Partnership.” The goal is to help in the plight of the honeybees, which have seen a drastic decline over the years. The Pollinator Partnership is an organization that educates and advocates best practices for honeybee protection. 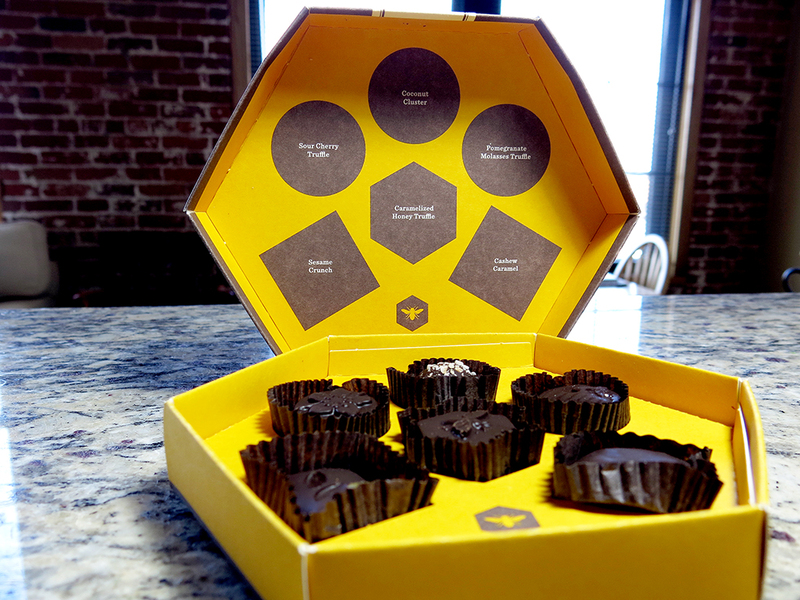 In keeping with its mission to save the honeybees, Gather Chocolates come in a honeycomb shaped box with six handmade dark chocolates inside that incorporate honey into the flavor profile. 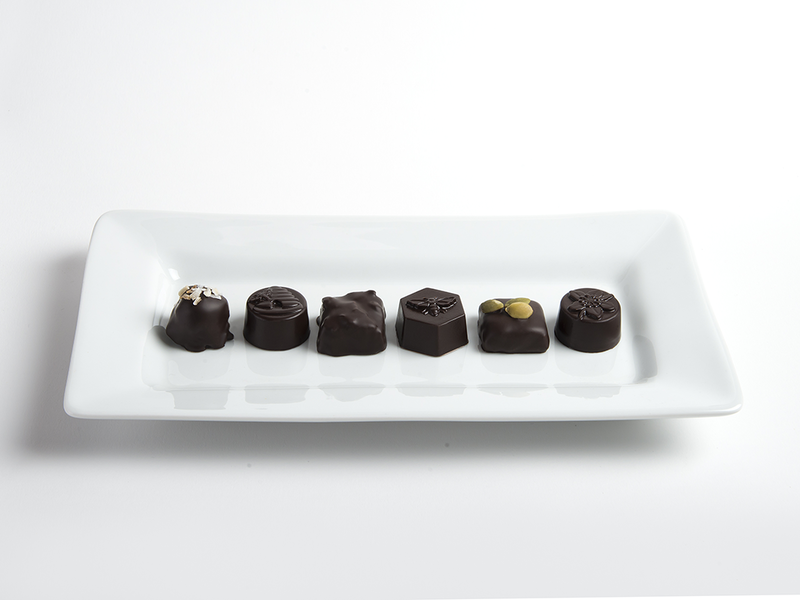 Each piece offers a completely different take on Gather’s gourmet dark chocolate. I can genuinely say that after trying this flight of six chocolates, I was completely blown away by their quality and beautifully balanced flavors. After hearing that these chocolates were linked to promoting conservation efforts, I expected them to taste like any other box of generic chocolates found at a pharmacy in order to minimize costs at the sacrifice of quality. I’m so happy to report that wasn’t the case and I would highly recommend these chocolates to any connoisseur looking for something great. A box of six pieces sells for $12.50 and a box of twelve sells for $18.50. 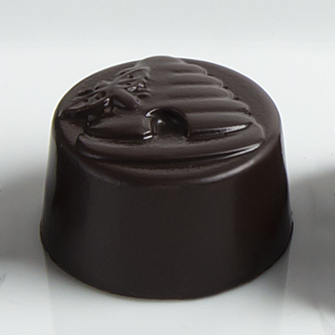 This signature chocolate has rich dark chocolate shell on the outside with a delicate chocolate interior filled with caramelized honey. There is a reason it’s in the center of the box because it features both chocolate and honey, which work together spectacularly well in this sweet bite. I found this chocolate fantastically delicious. 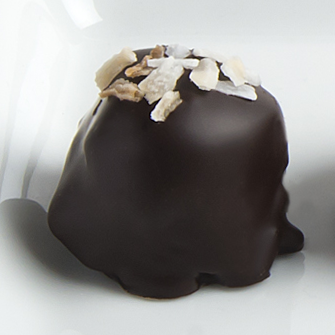 It’s like a gourmet Mounds bar with more chocolate than coconut, but still full of deliciously sweet coconut flavor. I’m always a little dubious when I see a candy featuring cherry because of the artificial medicine taste, but my fears were laid to rest with this delicious piece of chocolate. 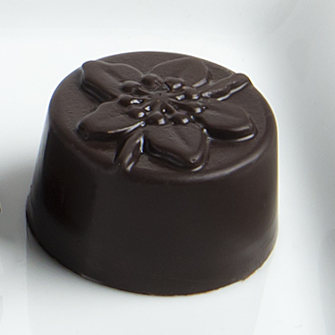 The cherry inside is actual, real cherry combined with soft chocolate. Overall, it’s sweet, but has a mild sour or tangy quality from the cherry. Imagine a less sugary cherry cordial. 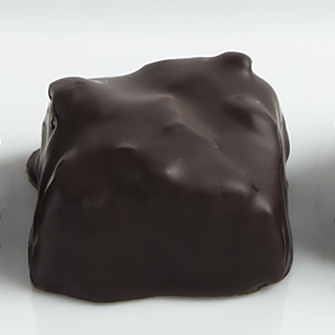 Dark chocolate outside with a velvety chocolate pomegranate inside. I once again thoroughly appreciated that the fruit flavor tasted like real fruit instead of some artificial filling. 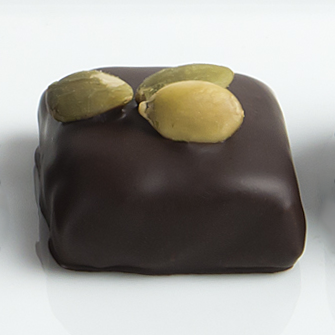 My wife loves cashews and caramel, so this chocolate really impressed us. The chocolate itself wasn’t too sweet or too thick, so despite the potential for heaviness, it actually tasted nice and light. Very excellent. I found this chocolate especially interesting because I love toffee. The sesame in this chocolate reminded me of a Middle Eastern sesame candy, but covered in wonderfully smooth dark chocolate and mixed with toffee bits. I can genuinely say that I never had these familiar flavors combined in this way, so I applaud this chocolate on its originality. Copyright © 2016 Man Fuel Food Blog. All Rights Reserved. The content on this page is owned and written by Man Fuel Food Blog (www.manfuelblog.com). Duplication or use of this content without permission is prohibited. The presence of this content on any site other than Man Fuel Food Blog is a violation of this Copyright. For permission requests to use some or all of this content, use the contact form in the “About” section. This is a sponsored post where I received a sample in exchange for a review. However, all opinions and writing are my own.